Thalmor Headquarters is located in Solitude, within the walls of Castle Dour. 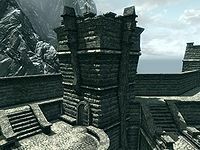 It is located at the top of a long flight of straight stairs leading up from the courtyard in Castle Dour, to the right of the door that is guarded by two Solitude guards, that leads to General Tullius, and the Imperial forces in Skyrim. It is through the door directly ahead. Despite what the name implies, the building is bereft of Thalmor and anyone else. It appears to have been abandoned suddenly: upon entering, immediately on the left is a wooden bench, with a large vase holding a snowberry bush next to it and a small cupboard opposite. Ahead, in the main part of the room, is a table with a tactical map of Skyrim marking the current status of the civil war. On the left, against the southwest wall, is a bookcase holding eight common books, a potion of health, a flute and a drum. Against the northwest wall is a small square wooden table and two chairs, with a bottle of alto wine, three salmon steaks, a seared slaughterfish and a potion of regeneration along with plates and goblets. Beside this table are two smaller round tables holding bread and cheese and a sample of tundra cotton. The northeast wall has a stairwell in the middle with flights leading up and down. To the left is a small cupboard, while to the right is a bowl of bread and a plate with a sliced eidar cheese and an iron dagger on. To the right, against the southeast wall are two more bookcases holding a potion of extreme stamina, a solution of strength and eleven common books and to the right is an unlocked displayed case containing a leveled dagger and greatsword. There are two more vases holding snowberry bushes, one half way up the stairs and at the top another. At the top of the stairs is a very large bedroom with a large double four-poster bed coming out from the southwest wall, with a basket containing a small coin purse to the right, a small round table to the left with copies of Death of a Wanderer and Killing - Before You're Killed on top, a long unlocked chest at the foot of the bed and a wall shelf above the bed on the southwest wall holding a common book and deathbell flower. In front of this is a narrow wooden table with a platter on top holding an eidar cheese wheel, three tomatoes and two loaves of bread. Against the southwest wall, to the right of the bed is a washbasin on a stand next to a small wardrobe containing fine clothes. Against the northwest wall is a small cupboard containing clutter, three vases, two of which hold snowberry bushes and the third holds tundra cotton and further to the right is a narrow table with a platter holding two sweet rolls and two honey nut treats and a plate holding a red and green apples on top, while in front of this is a low table and chair with a plate of bread and cheese, a goblet and a potion of regeneration on top. In the eastern corner is a large planter with holding a plant. Against the southeast wall is a set of shelves holding a potion of health, a potion of enhanced stamina, a potion of regeneration, a potion of extra magicka, two common books, a flute and drum. Next to this is a small unit holding a bottle of alto wine and a vase with a bunch of tundra cotton in it. In front of the shelves and unit is a low table and chair with a plate of bread and cheese, a goblet and a potion of regeneration on top. In the southern corner is an open to an area with three tall wardrobe containing a collection of clothes and fine clothes and a set of shelves holding two samples of slaughterfish scales, a potion of haggling, a bowl of glow dust, two bottles of frostbite venom, a deathbell flower, a bowl of void salts and a basket containing two bunches of lavender. Descending the stairs leads to another room, this one covered in cobwebs and dust as if it hasn't been used in a while, with a cooking pot on a stand right by the bottom of the stairs on the right. There are two single beds coming out from the rear wall, with a wall separating them. Both areas are the same with a single bed and a low empty table in each. In the enter of the room is a small square wooden table and chair, with a common book and empty wine bottles on top of the table. Against the southeast wall is a small set of shelves holding a woodcutter's axe and mead barrel, while against the northwest wall is a cupboard holding a few more empty bottles and other clutter. To the right, in the northern corner is a second cupboard, this one holding two sweet rolls, a bowl of tomatoes, a few loaves of bread, several pieces of cheese and with a raw haunch of venison on top and food barrels on either side. Taking anything from this location is considered stealing. Since there are no NPCs in this cell, it is a good target for Bedlam jobs targeting Solitude. Entering the headquarters is trespassing, therefore, you cannot wait or sleep in this location, unless you are aligned with the Legion. This page was last modified on 24 March 2017, at 05:39.